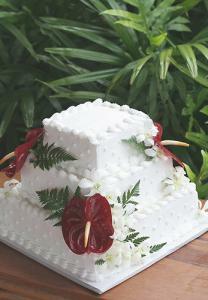 An island wedding is fun and wedding cakes should reflect this tropical setting. There are plenty of creative island designs that can be combined with a traditional wedding cake for an ideal island dessert. There are plenty of offshoots on the island theme for wedding cakes, so if you're looking for more inspiration, consider a beach cake, a shell cake or a general sea themed cake. 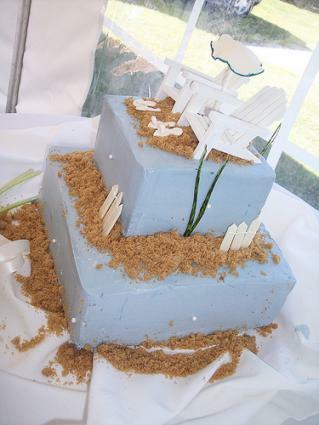 Cake decorators have all kinds of creative ways to incorporate "sand" into a beach or island themed wedding cake, and all of them are tasty. For a rough texture, a decorator might use crumbled graham crackers or wafers; a finer texture might call for brown sugar or dark turbinado sugar. If the idea of having a cake that's a little wacky pleases you, then consider exploring the vast possibilities that island creatures provide. You could have a tiny fondant sea turtle cruising on top of a pale-blue cake, or a school of fish weaving their way up the sides of a deep indigo cake. One especially fun idea for a topper is to have your decorator make tiny fondant figures of you and your soon-to-be spouse in island-appropriate attire, such as a muumuu and a Hawaiian shirt with board shorts. If you're planning a destination wedding or getting married on an island that's nowhere near your home, you'll need to talk long-distance with a florist or decorator. That could complicate some communication issues and make it tough to narrow down your design choices when you can't see samples in person. However, looking at online portfolios and sending snapshots of existing designs or ideas can help you get what you want and ensure that the process goes off without a hitch. Finally, a few words about budget: Although an island cake is an excellent idea for a tropical or destination wedding, it can be very pricey. The more detail you want on your cake, the more it's going to cost, so be prepared to shell out quite a bit for an elaborately decorated cake that reflects the theme and your vision.